The horrific fire at Grenfell Towers in west London in the early hours of Wednesday has shocked the entire nation. The images of the tower block ablaze in one of the world’s leading cities conjured memories of the 9/11 tragedy in New York in 2001. But unlike New York, which was attacked deliberately by Islamic terrorists, the Grenfell Towers fire was a self inflicted disaster. Brought about by the callous pursuit of profit for construction firms and a negligent, uncaring government set on slashing public spending and building safety regulations. 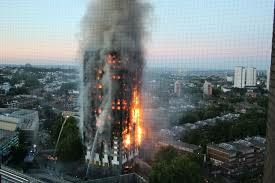 Police fear that in excess of a hundred residents have perished in the fire. As the shock at least begins to subside, it is increasingly being replaced by a feeling of anger that these poor people, the residents, have been sacrificed to the ideology of free market neo-liberalism. Many questions are being asked, but not so many answers are being proffered. A group of angry residents stormed Kensington Town Hall this afternoon to try and get some answers. David Lammy, Labour Party MP for Tottenham in London, has called for criminal charges to be brought against those responsible for the decision to clad the building in combustible plastic material, which is banned from use in the US for buildings above 15 meters in height. There have been several fires in the US and elsewhere where this type of cladding has made fires worse. Speaking to the Municipal Journal (subscription), the chair of the Passive Fire Protection Forum (PFPF) who is also a trustee of the Children’s Burns Trust, Hannah Mansell, said: 'To every local council and housing association, I say, you know what to do, take action today. The next one could be tomorrow. Ms Mansell added that the PFPF has been warning about the risks of a fire like this for years and that there is an 'endemic' fire safety problems in buildings such as this one. She said she has seen flats without fire doors, emergency lighting or signages or smoke seals. Minutes from a 6 January 2016 meeting of Kensington & Chelsea housing and property scrutiny committee about the refurbishment of the building, noted new cladding, now thought to be among potential causes of the fire, “improved the look of the building,” according to the Local Government Chronicle (subscription). The original plans for the refurbishment of the block had been to site boilers in kitchens but “it had then been considered easier to place these boilers in the hallways which had been conveyed to residents”, the minutes said. In October last year Gavin Barwell, who lost his Parliamentary seat in Croydon Central at last week’s general election, and who has been appointed as Prime Minister Theresa May’s new chief of staff, announced a review into Part B of the Building Regulations 2010 that cover fire safety in tall and wooden buildings. The Part B review was due to look at how fire safety measures could be improved following a major fire at Lakanal House in Camberwell, south London, in 2009, in which six people lost their lives. Earlier this year Southwark Borough Council was fined £270,000 and order to pay £300,000 legal costs after admitting safety failings at Lakanal House. If criminal charges can be brought against individuals, as David Lammy suggests, then of course they should be. But the problem runs far deeper than negligent individuals who, are only acting within the logic of neo-liberal ideology, where ‘red tape’ (safety regulations) must be cut, and housing policy is to maximise profits for building firms, and increase the value of surrounding privately owned properties in an area. The right wing media has tried to blame the fitting of the wall cladding on an ‘obsession’ with ‘green’ issues, that is energy conservation, but this was a secondary consideration. As the minutes from the local authority’s housing and property scrutiny committee, quoted above demonstrate, that making the outside of the building more attractive for some of the very rich residents in adjacent flats and houses was the primary goal. Non-combustible cladding could have been used instead, but it is a little more expensive at around an extra £5,000. Too expensive for the likes of the working class residents of Grenfell Tower. Things have got to change, people before profit.